Ultimate guide to low-latency osu! on Linux (rev.12) · forums · community | osu! Thanks again for this! I tested today with the winepulse alterations and I'm getting performance similar to what I get in windows, with no crackles so far. Sometimes the sound gets really distorted, even unrecognizable, in which case I have to restart pulseaudio to fix it (this used to happen in wine applications for me a while ago). This only seems to happen when I open new applications that use pulseaudio. Let me enumerate the problems you fixed for me . I can now record with obs, use hitsounds without changing my offset every time (makes mapping much easier), play hitsounded beatmaps, so I can re-enable effect sounds now (like the countdown and miss sound). Because I had a -130ms offset before, it messed with the AR of the first note on most maps and made getting a 300 on the first note really hard if there was no musical lead in. That's been remedied too I noticed you got some of your information from other sources but its the winepulse alterations that helped me, so here's another thank you from me, hopefully showing you how grateful I am I'll let you know if I find anything I can help with! /var/log/Xorg.0.log:[    19.007] (II) LoadModule: "glx"
/var/log/Xorg.0.log:[    19.016] (II) Module glx: vendor="X.Org Foundation"
/var/log/Xorg.0.log:[    19.024] (==) NOUVEAU(0): GLX sync to VBlank enabled. Thanks for the suggestions, I've tried several versions, all with the same issue. What's funny, is I downloaded a simple WIndows OpenGL benchmark application, and ran it through wine with no issues. Are you using the latest Cutting Edge version? What's the process to put it in compatibility mode? There's a checkbox in the options menu. However I use the closed source nvidia drivers and note no difference with compatibility mode. I get 1k+ fps regardless. osu is perfectly playable for me now on linux because of the delay being fixed, but I've never had fps issues. I had a geforce 8800 gts before and switched to a gtx 660. I'm not sure what the problem would be here but I can report extremely good fps performance with the closed source driver and those 2 cards. Not that I think it matters much but I'm using wine staging 1.7.51 patched with Francesco's winepulse on arch linux and nvidia drivers 352.41. Working sweet on stock kernel 4.1.8 and ck kernel too. Also works fine on both beta and cutting edge release streams for me. Are you sure the wine prefix is setup correctly? I have about racked my brains trying to fix this issue. I really think it's the wine prefix, so I'm going to try deleting it and starting again. I have a NVIDIA GeForce GTX 670. I locked 902 fps on windows, so I should be getting acceptable performance on here. Using nvidia-346 drivers and and 3.19.0-28-lowlatency for Ubuntu. I have literally done EVERYTHING to get OpenGL to see the 32bit libraries, so I really think it's wine. Will report back. AT LAST. After untold hours, close to destroying my PC, I have succeeded! It ended up being the wine prefix. I had reset it previously, but for whatever reason something was still screwed up. Since I'm at work I wasn't able to play, but getting 120fps capped on the menu was 100x better than stable, so fingers crossed it will be nice and smooth . Thanks for your help! Runs perfect on Debian 8 with XFCE. i5-4690k and AMD R9 280x. Interestingly, setting it to unlimited fps matches my monitor refresh (60Hz), but it runs 240 fps just fine. However, in winecfg, with winealsa.drv running, the test sound option did not work. The dmixer terminal test and osu sound just fine though, so it is just the winecfg. 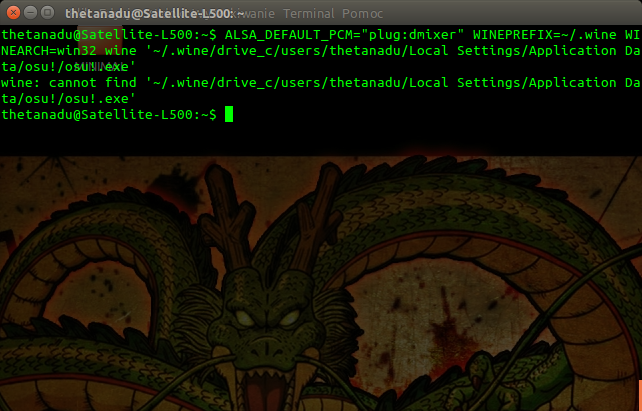 Hey dude, I appreciate the guide, but at the step where we fix the bancho disconnecting, I follow your exact instructions of replacing the user name with my own user and executing the command ALSA_DEFAULT_PCM="plug:dmixer" WINEPREFIX=~/.wine WINEARCH=win32 wine '~/.wine/drive_c/users/<your username>/Local Settings/Application Data/osu!/osu!.exe' leads to Ubuntu saying wine cannot find this. I have replaced my user name, and i have checked to see whether the directory was correct and it indeed was correct. I dont know what is causing this issue but it is preventing me from playing online, any helpful advice would be appreciated. try ~/.osu/drive_c/users/<your username>/"Local Settings"/"Application Data"/"osu!" The thing i'm not able to do however is get OpenGL to work. I must say though trying to change the release stream from stable(fallback) to cutting edge doesnt stick. it goes back to stable fallback immediatly and says osu is up to date. Got any idea whats going wrong? Dude, awesome! I tried to set up osu! on Linux in the past but I never got it to work fully (either there was too much sound latency, input lag or low fps, etc). I followed your guide on a clean Xubuntu install and performance seems to be on par with Windows (at least at a first glance). to ZarosTenjin and kaiske, I had the same problem, whenever I click on Cutting Edge the game would automatically go back to Stable (fallback). What I did is start the game in Windows, set it to Cutting edge there and then just copy the files over to the Linux partition, worked like a charm for me. hey, I have problem when I must connect to buncho. I have that massage - what I can do if I don't have that? Z tej strony TheTanadu, gracz Polski w OSU!. Preferuję najbardziej osu!manię, chociaż ostatnio maniaczę w OSU!. Używam myszki Tracert Ghost LE. Gram na laptopie Toshiba Satellite L500-1Q9, więc nie jest super wydajność ale się staram.